I was recently reminded that my first national book, The Other End of the Leash, was published in June of 2002, ten years ago (thank you Lisa). Wow. Ten years. It feels like a long time, and it feels like the years have flown by. Time is like that. It’s true that our differences from dogs causes no end of problems, from people mindlessly hugging dogs who perceive it as a threat, from running toward a dog to get him to come to us when in reality it causes him to stop. One of the most gratifying consequences of the publication of The Other End of the Leash is the receipt of notes and emails from all around the world that thank me for helping them to better understand their dog, or to save a run away dog from being hit by a car. (The book, I say sheepishly but unable to stop myself, is now published in 14 languages–or is it 15?–a fact that continues to delight and amaze me.) I still love playing the “contrast and compare” game between dogs and people, asking what is the same and what is different as a way of enriching our relationship, and I being one voice, in a chorus of many, asking dog owners to respect and understand their dogs, rather than dominate and treat them like small, furry people trying to take over the household if you drop your guard for just a minute. I also appreciate, even more now I think, the importance of a dog’s ability to link us to rest of the natural world. It’s a tragedy, in a way, that we speak about ourselves and “nature” as different things, as if we moved isolated and above all the rest of creation. We don’t. We still need air and water and food to eat and a place to poop like other mammals. Almost as much as that, our spirits need to see leaves fluttering in the breeze and the sun shine off the water. We need to marvel at the intricacies of a daisy and the jazz riff of a house wren as she sings beside her nest. There is a growing body of evidence that being outside, in the “natural” world is good for you. See, for example, The Children and Nature Network. And what do dogs do? Besides cuddling beside us and licking our faces and acting as if we hung the moon, they get us outside, on the grass, under the trees and in the rain. Bear with me while I repeat myself: No wonder they are our best friends. Here’s an excerpt, relevant to that point, from what I am writing now. Be forewarned, it will be years before this book comes to light, at least a year before I am done writing it. But here’s something I wrote this morning that feels relevant to the anniversary of the publication of The Other End of the Leash, about a pair of Barn Swallows that nested in my garage, and wreaked no small amount of havoc to my daily routine. It’s yet another example of the importance of a conscious and respectful connection to the natural world. And then one day, one magical day that I will remember for the rest of my life, I came home to find all five baby birds straining so far out of the nest that I knew their first flight was inevitable. I stood in the garage and watched one bird after another take its first flight. Each bird dove out of the nest flapping crazily, it’s movement uncoordinated and seemingly inadequate to keep them airborne. At the last minute, as they zig-zagged toward the ground, their wings took hold and they managed to stay airborne. They’d fly for a few more seconds, seemingly at the edge of airborne disaster, and then slam into the nearby spruce tree, having as much to learn about landing as flying. But gradually, second by second, flap by flap, the movements of their wings became more coordinated, their paths through the air became straighter, more purposeful and they figured out how to land without smashing head first into a bough. As the seconds stretched into minutes, they began to learn what was inside of them. They found what they had all along, an innate combination of ability and knowledge that lifted their bodies and directed their flights. They began to dip and turn, faster and faster now, until within just a few minutes I was watching five expert, tiny pilots, zooming right and buzzing left, streaking toward my face and veering off at the last minute. They looked overwhelmed with themselves and the joy of what they were capable of. I was overwhelmed too, with wonder and delight at their transformation from chubby, awkward babies into sleek, skilled flyers. I am still overwhelmed, just writing about it, at what me and five baby birds learned in just a few minutes inside my shabby old garage. I am grateful for every day that I live on the farm, even when it’s 107 and it almost kills me to haul hoses to try to save the trees or 30 below and the water pipes in the barn are frozen and I’m carrying buckets down an icy hill to the barn cussing like a sailor. I write knowing that not everyone can live on a farm, and that I am a lucky woman. But I spent as many years of my adult life in tiny apartments with moldy showers and dank, stinky corridors as I have on the farm. I shared cans of Alpo with my Saint Bernard because that’s all we could afford, and bought my clothes from Goodwill. And I learned, that no matter where we live, we can all cherish a flower, put up a painting of a lake, sit under a tree in a park and listen to a robin sing to the sky. And if we are very, very lucky, have a dog with whom to share this amazing journey through time and space. MEANWHILE, back on the farm: Willie is a happy boy. It’s still hot but not as bad as before, and we’ve been able to work sheep for short periods of time. I’m working on my timing while driving (the sheep away from us), trying to react fast enough to keep them in a straight line instead of zig zagging around the field. Let’s just say I have miles to go before I sleep. Willie isn’t putting a paw wrong on this, this is all my challenge. He needs to work on driving at a distance and staying comfortable letting the sheep get farther and farther away from me (and trusting that he an maintain control), but we can’t practice that on my little, short pasture. Hoping to do that this weekend. Willie also got a new toy yesterday. 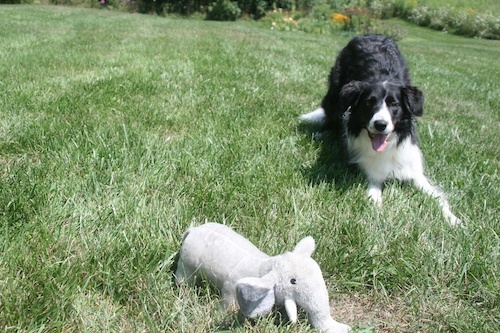 It’s one of the new ones for sale on our website in the section named “Toys and Fun Stuff.” The toy is “Ellie the Elephant” and we love her because she is one sturdy pachyderm. I suspect she’ll even stand up to Willie’s tough love for quite awhile. I’ll keep you posted. I’ll let the photos tell you whether he likes it or not. Willie decides to get acquainted. 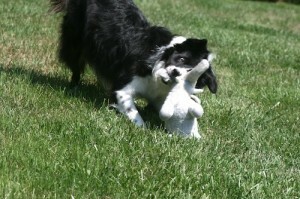 Here’s Willie’s impersonation of a rat terrier, as he begins to attempt to shake Ellie back and forth. Good thing he doesn’t know she’s an elephant. Yup, this is almost as fun as sheep herding! And finally, after a long play and photo session, Ellie and Willie rest in the grass. Willie looked so contented I half expected him to ask for a cigarette. Today is my daughter’s 19th birthday so your post about anniversaries is especially timely. I tend to be focused on what’s next and need the reminders to look back and see where I’ve been. It’s yet another thing my damaged Finna is teaching me. My blog has a monthly Finnaversary post where I look back at where we began and where we are now because with Finna we’ve learned that we have to celebrate the small victories. Today on a scale of 1-100 she’s probably a 7 which isn’t great when the goal is a safe, sane, and reliable dog but when you consider that she started at a -50 it’s a remarkable achievement. http://rangerandhiskat.blogspot.com/2012/07/eighth-month-finnaversary.html links to the latest Finnaversary post if anyone is interested. On my blog I also have a series of Ranger Recommends reviews of books and other media that have helped me to better understand my dogs. Ranger or, as we call him now that we have Finna, St. Ranger the Good, recommends those sources that have made my relationship with him better. Other End of the Leash is on that list along with several of your other works. Living with Ranger and learning to understand him better has given us a leg up on rehabilitating Finna. I can’t thank you enough for your books which have made a huge difference in the lives of my dogs. As for the natural connection or connection to nature if you prefer, I grew up with animals and I grew up outside. I’ve always had that connection. Ranger reconnected me with life. I adopted him a couple months after finishing breast cancer treatment. 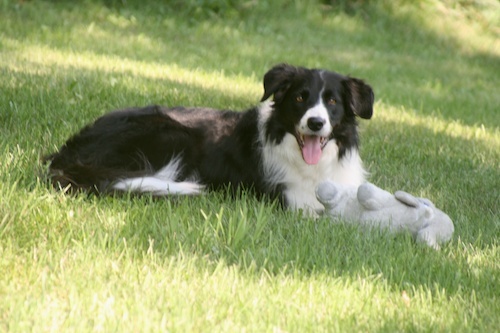 No one in their right mind would ever adopt a high energy herding breed two months after the last cancer treatment but no one ever said I was in my right mind. Ranger got me outside, moving around, and meeting people at a time when I’d lost my sense of connection to others and the world. He brought me back to living life. Finna makes me aware of the little things and the need to celebrate the small victories. In a world that is rush, rush, rush she makes me move slowly and deliberately. 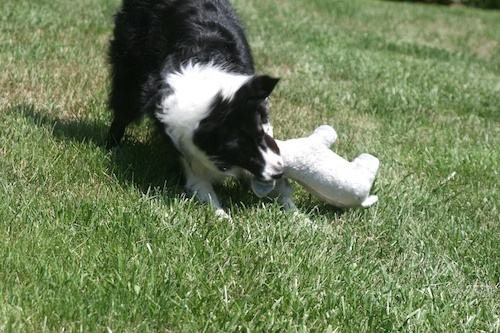 And finally, thank you for the photos of Willie and his new toy. It’s delightful to see him looking so happy and satisfied. Happy 10th Anniversary! What a terrific book you wrote. I know how much I took dogs and other animals for granted as just part of the world around me interesting but without a sense of deep connectionto them until I got my first dog MAC about 20 years ago. Watching the world through his eyes and learning from him as he learned from me was a breathtaking experience. I gained a much deeper appreciation for all mammals and their behavior and interactions within their own species and with other species. I didn’t read “the Other End of the Leash until after MAC died. My next dog was not in the least MAC-like and the book probably saved her life and mine. I am now on my second copy of TOEOTL. It’s out on loan (that’s how I lost my first one) but I am going to retrieve it soon. I have read it whole and in part more times than I can say and it still makes me laugh and cry. Thank you for writing it and making my and my dogs’ lives more peaceful and happy. 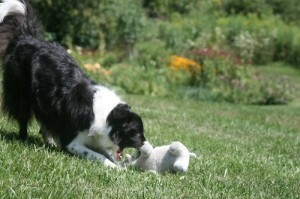 If I ever felt embarrassed or different about my wonder and joy at dogs, those feelings disappeared – about 10 years ago. Happy anniversary! Your books have all helped me immensely. I think it was TOEOTL where you used the term “social climber” (forgive me for not being certain). When I read that term, it was like Oscar’s behavior started to make sense. I have been on such a journey with him: behaviorally, emotionally and visually to start and more recently medically. The journey has opened my eyes more than I ever could have imagined, and I experience things so differently now. Many, many thanks for your wonderful work and for the enlightenment it has brought me. We are so grateful. I actually left on a comment on your facebook page. Kaiser my first dog, a beautiful doberman I coveted at the age of 44. A long wait, always, always wanted one. I never knew how different all the birds sound in the morning or how good rain can actually feel on a warm summer day until Kaiser. He is only a year old. Everyone else is reading 50 Shades of Gray on the beach while I thoroughly enjoyed The Other End of the Leash! I had so many Ah Ha moments reading your book. Especially, turning your body and facing in the direction you want your dog to look truly amazing, and turning sideways when calling him works like a charm. Also, quieting my big mouth when we are walking instead of saying a bunch a crazy words like “don’t you dare!” as a skateboarder goes by, I feel in more control and he is to. I could go on and on!! Yes, I agree with you on the Alpha view. Thank you so much and I have all intentions of reading more of your books. You have a great intuitiveness with animals and you are also blessed to have a talent to write well. Forget E.L James lol!!! Thanks for the Wisdom, Mary Gunnison and Kaiser nosebumps! I read TOEOTL a couple of years ago and was spellbound. I am now enrolled in CATCH Dog Training Academy and your book is part of our required reading. I was VERY excited to be able to read it a second time (with a new book to underline and write notes in the margins). Again, I am spellbound. Thank you for your transparency. Your thoughts resonated perfectly to me. It was such a delight to feel that on this planet, I have a kindred spirit! Its after 10pm. Most days I have to be up before the sun for work so its not often I’m awake at this hour. A short while ago, Meg told me she needed to go outside and made me get up to let her out. Bear went out too. Both dogs are pretty good about doing their business and coming right back in, but tonight they lingered a while so I stepped out on the porch to see what was up. I stepped out underneath the biggest, clearest sky with the brightest stars I’ve seen in a long time. The smell of a warm summer night and my blooming day lilies is quite strong and refreshing. The only sound is the song of crickets and frogs and wet noses sniffing the tall grass. I’m very glad that I have dogs to show me these things. I’ve read the Other End of the Leash a couple of times now and I feel like I always knew most of what I learned in that book. Does that sentence make sense? While searching for books on dog/human relation TOEOTL kept climbing upwards in my reading suggestions. Into the first pages of my ebook excerpt I knew I had to continue reading so I ordered the paper version, together with Family Friendly Dog Training, which already had to be replaced cause I gave it away as a present immediately after reading. These two books will become my starter’s bundle for friends. I finished TOEOTL a couple of days ago, I actually had to slow down my reading to give thoughts enough room, and I already know I’ll read it again soon. Is a French translation planned too, or do they already exist and I just can’t find them? All your comments are so gratifying, thank you thank you. I’m reading them and feeling inspired to continue writing every morning on my new book (sort of scary to start a new book you know!). To Kerry: I do know what you mean, as I wrote the book I felt like “we all know this,” but then, we don’t. I think that’s part of what I do, give voice to things we ‘know’ deep inside but don’t always consciously know that we know…. If that sentence makes sense! And Martina, OEL has not been translated into French. I would love it if it was! So far no French language publishers has been interested…. Congratulations on your anivursery. I read TOTEL a few years back and loved it, and I’ll have to read it again. I would say, that my dogs have allowed me to appreciate nature, but not in the same way other commenters here have described. I was walking to finals, about 10 years ago now, and I was breathing in the smells of all the blooming trees around campus. I loved the warm air on my face and I loved hearing the wind through the leaves. At my side was my first Guide dog, Marlin. I felt completely relaxed with him there, able to let my mind wander in any direction because he would keep me safe. I can’t do that with my cane. With a cane, you have to be so hyper-aware of your environment that it is exhausting to go to the store for milk. With Marlin there, I could relax. He was saying, Trust me, I will not let anything happen to you. He prooved that to me a few minutes later when, in the middle of a sidewalk, he stopped abruptly and wouldn’t move. I indicated he should go forward, and still, no movements. It was then that a huge delivery truck backed out of a driveway and it’s beeping backup signal wasn’t working. I could’ve been killed. I am a happier person because of my dogs, a happier traveler and I’m so happy I am able to find people who can teach me more about how dogs think and behaive. It helps me to understand dogs better, and in turn, my responses to them change. We learn and grow together. I’ve loved animals and nature all my life — I became a field biologist. My husband and I worked together for nearly 26 years on conservation ecology in Belize. Even with all my time in the wild, it’s not complete unless I have a dog to share it. Our sweet Maggie, now at the Bridge, shared a decade in Belize with us. The stories she could tell … ! Now back in the USA, we recently adopted a 2-yo maltese/poodle that had lived in a pen with her sister. Her family turned her over to rescue when they realized they had no time for her. She had very little outside experience and it has been fun discovering the natural world with her. We’d only had her a week or so when we were taking a (leashed) walk. In the middle of the asphalt a newly hatched swallowtail butterfly was slowly fanning its wings, drying them. Esme stopped in her steps, tentatively put her nose out to it. She looked up at me, her eyes enormous: “Would you look at that — that’s amazing!” It was a moment of absolutely perfect communication between us, our first. And I enjoyed that butterfly that much more thanks to sharing the moment with her. Thanks for the chance to revisit the joys of dogs in the natural world, as well as OEL. Through this discussion I realize that both can be similarly rewarding. Though seemingly unlikely that a book would have much in common with dogs’ abilities and role in nature, they function in many of the same ways. They are ushers, navigators, and companions. Each time my dog pauses, raises his tail and looks off trail he offers an alert. Every extra long stop-and-sniff is an opportunity to monitor change, even very subtle change, in a landscape. Any time the dogs switch from the groomed human-sized trails to one of their smaller dog-sized paths I’m reminded that there are optional routes to be forged in life, and that discovery lies everywhere. So true, too, of the best books, when each chapter, story, and fact makes you more aware of your own journey. And when things get scary, like when hearing the sound of crunching sticks signaling the passing through of a large unknown animal, there is nothing like having a trusted aide by your side. With knowledge, practice, and intuition, I hope offer the dogs the same, and be the best possible liaison for the rest of the man-made world. Dogs in nature, and OEL, absolutely show us what we know but aren’t always conscious of, and awaken our skills like baby birds learning to fly. Sending out good memoir-writing vibes! OEL is an amazing book. One of the dog-connects-me to nature lessons I learned from the book pertains to smell. I remember reading the chapter on scent, specifically about getting down on the ground to smell what it was that your dogs were smelling. The very next time I walked my dog, I too got down on all fours and joined in on the sniffing (we were in a remote area, needless to say). I was quite surprised to learn that the patch of grass he was smelling really did smell quite different from the surrounding area. I think OEL really taught me to stop, watch, and consider the world from a canine point of view. My dogs continually connect me to nature by keeping me outdoors. We hike everyday, it’s one of my greatest pleasures. I love that we get the time to explore together. Their ability to find newness in the same trail from day-to-day makes me appreciate how alive the woods are. Six months before I got my first dog, I started reading about dogs. I wanted to be Ready–with a capital R.
Hearing about my goal, a co-worker gave me two documents to read: one by Millan and the other was your Leader of the Pack booklet. From there, I went on to read a book by each author. Your book was The Other End Of the Leash. By the time I was through with the two books, I knew 100% which person knew more about dogs and which person’s work I would be devouring every chance I got. I’m so grateful that you have shared your insight with the rest of us. You helped me appreciate my dog a million times more than I would have if I had not gotten the understanding of dogs which I got from The Other End of the Leash and then later your other materials. My increased connection to nature is not so much directly from my dog. It more comes from having the greater understanding of all non-human animals that I got in part from The Other End of the Leash and For Love Of A Dog. Those teachings apply to cows and goats and pigs and chickens as much as my dog. In fact, I felt so much closer to animals that it wasn’t too long before I became vegan. There were a lot of influences in my life for that choice, but your books were in there. I know that was never your goal, but I am grateful for the path my life has taken. Happy anniversary! I read TOEOTL three or four years ago, while still in the early stages of learning how to live with and help a severly fear reactive dog. It was incredibly helpful in my learning process and remains a book I recommend as often as possible. For the last few years, I’ve been on a mission to bring hummingbirds into my small yard. I am an obsessive gardener, so filling it with bird friendly flowers was easy. Hanging a feeder was easier. This morning, I watched two have “words” over who was going to have access to the feeder. No matter what they are doing, they are a wonder and a delight, as are all the other birds who have taken up residence in response to my efforts. The chickadees have taken to drinking from the “ant well” in the hummingbird feeder and that has produced several interesting interactions between chickadee and hummingbird. A few days ago, a small flock of Great Egrets cruised overhead! And I live in the city! Nature is not “out there” it’s everywhere if we care to pay attention. Doing so enriches us in ways we can hardly understand but absolutely need. We all need to get out there and pay attention, for our own sake and for humanity’s sake. Congrats on your anniversary, Trisha! I have been grateful for your insights and for TOEOL for years now; so well-written and packed with info from a knowledgeable, educated source. Plus, you give credit where credit is due; to the dogs, ofcourse! 😉 and to your other helpers. I have recommended it without reservation to many readers who love dogs. As a child I followed my dog into the woods and we would spend many happy hours there, it was my favorite place to be. There was no commands to follow, no leash laws, no rules, just a natural simple way of being together with love and respect. To me, my dog was my equal and the woods were my home, it was a magical time. This was forty plus years ago and it was a very different world. I feel sad that so many children today don’t get that freedom and have that connection, and I’m concerned about the cost of that to both them and our world. I return to woods, the shore and the fields with my dogs the moment I get home from the office. My dogs are the the bridge that take me back to the natural world and they help to keep me connected, grounded. I am grateful for your writing and your books as they too help me to slow down, observe, think and make important connections and compassionate responses. Thank You! The French are extremely stubborn when it comes to applying changes and canine education is often a ‘task’ clubs think they are the only ones eligible to perform – with trainers working as volunteers and clubs only accepting pure breed dogs and even looking down on Labrador and Golden Retrievers. These are sites where human dominance is at the core of the education and physical reenforcement such as alpha rolls are highly recommended. Word is slowly getting around, that there are other ways of education and more and students are finding their way to my trainers school (where I’m training to become a trainer/behaviourist/comportementalist), which focuses on socialisation and relationship human/canine. Your book was and is a real gold mine of information for me, and I would love to see more people reading it. My trainer is fluent in Spanish and I recommend the spanish translation OEL to her. While I cant promise anything, I believe that her connections to a nationwide animals-program can be of help. Now I have to get back reading the chapter about body blocks, something my lab doesn’t seem to have read. To be followed by a quick retread of ‘love has no age limit’ with a live translation to German. Looks as if the older, smaller dog which my partner will have no trouble holding, would be moving in a lost faster than imagined. If the encounter between him and ours turns out fine, we’ll have three dogs by next Saturday afternoon. But before reading I’ll enjoy a walk with the dogs along the canal which goes through the nature reserve that starts a five mins walk from where I live. About our relationship to nature and our dog’s part in it. Like you I think that the connection we can have with dogs can teach us a lot about how to connect with that non-human world out there where not everything can be put into words and can be controlled by rational thinking. And although I understand all the reasons for limiting where dogs can and should run free re wildlife, safety, &c. — still, every sign I see saying “total dog ban”, “no dogs” or with a dog struck through with a big fat cross line leaves me with an uncomfortable feeling, nagging away somewhere deep. Just another step in humans controlling when and where we allow us being encountered by other animals. I know I’m a little late with replying to your post about the tenth anniversary of TOEL. But I’ve just finished reading it for the second time. So much to learn from it. And I’ve just written a post on my blog, about some of my favourite points in the book and why I wish even more people working with dogs would read your book(s).